I'm on a mission to help men, women and their families make Christ the center for their Christmas celebration! Will you join me? "As the world around us shakes in chaos, uncertainty and fear . . . you and I can enter into this 2010 Holiday Season with confident expectations of hope, joy and peace . . . "
Why? 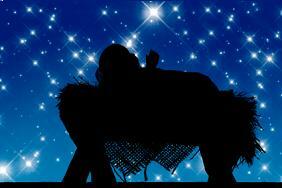 Because we can have an intimate relationship with the Heart of Christmas . . . with the Reason for the season . . . with the Son of God who first gave to us and cares for us with unbridled love. My hope for you and your family is that you will experience Jesus this holiday (holy day) season in new and meaningful ways! Here are some of the valuable resources and lessons you will find in the 100+ pages of It's All About Jesus eBook and eWorkbook! Learn about the Christian Church Year and how you and your family can celebrate Advent as you prepare for Christmas. See how you can adopt the 12 Days of Christmas to extend your joy . . . and take some of the pressure off December 25th! Discover the supernatural power of making a quality decision and declaration to center on Jesus! 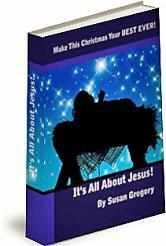 lso will receive a multifaceted It's All About Jesus! Planning Workbook that you can print and use to make well thought plans for your holiday time including gift planning worksheets, meal plans, budget worksheets, craft planning tools, calendars and much more. I can promise, this part alone is worth the price of the whole book as you see how a small investment in planning time can save you hours of stress, many dollars . . . and set you up for your best Christmas ever! One of the most powerful benefits of the It's All About Jesus! Planning Workbook is that you will be guided through a process that will draw you into a more meaningful and spiritual experience with the Lord! The eBook also contains hundreds of links to creative and valuable Internet resources where you will find recipes, craft instructions, hard to find gift items and much more. 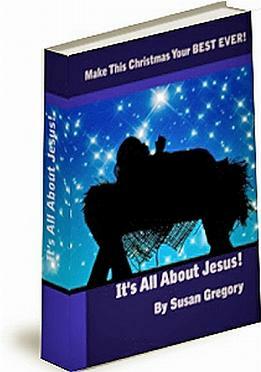 Touching Christmas stories that build your faith and warm your heart. More and more tips that will help you give more and spend less! Readings to share with your family and friends, or for your personal enjoyment. Some are heartwarming, some of funny, all are entertaining and meaningful. Hints and methods from other readers as they share their tried and true ideas for Christmas success! Finally, I give you my personal guarantee! If you are not completely pleased with your purchase, just let us know and you will receive a full refund - no questions asked! We just ask that you make your request within three days of your purchase.